(Houston, TX) – Two graded stakes garnered the lion’s share of attention in Sunday’s Houston Racing Festival at Sam Houston Race Park, with Midnight Bisou capturing the Grade 3, $300,000 Houston Ladies Classic and a third consecutive win by Bigger Picture in the Grade 3, $200,000 Connally Turf Cup. However, the four undercard features provided tremendous excitement, as well as a few surprises, for the well-attended day of racing, as well as a few surprises! The $75,000 Frontier Utilities Turf Sprint, a five-furlong turf stakes, drew a full field of ten, including defending champion Hogy. The victory belonged to Sad Sac Racing’s Wings Locked Up, who ran a standout race, scoring a 1 ¼ length victory under Glenn Corbett. The 7-year-old gelded son of Munnings, winner of the 2018 Houston Sprint Cup, a six-furlong main track stakes, added his sixth turf victory today, covering five furlongs in :56.40 seconds. He is trained by Clinton Stuart. American Sailor, owned by Raj Jaganan ran a solid second, under Lane Luzzi. Defending champion Hogy, with Jose Ortiz in the irons, rallied four-wide to complete the trifecta and Game Loading under jockey Lindey Wade, at 55-1 ran fourth. 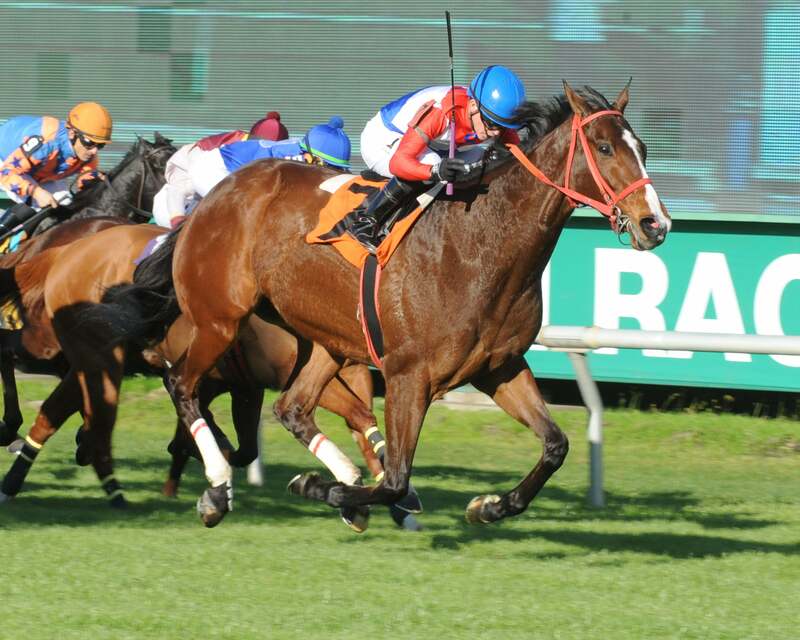 Claimed for $25,000, Wings Locked Up has won five stakes races, and has earned $609,907. Trainer Stuart Clinton said that the Oklahoma-bred would likely make his next start at Oaklawn Park. Stakes action got underway with a full field of accredited Texas-breds in the $50,000 Houston Turf. It marked a mixture of stakes winners facing turf runners seeking to notch their first career stakes win. It was the up and coming Highway Song who stepped up in the mile and one-sixteenth event. Danny Pish bred, trains and co-owns Highway Song with Denis Foster. The 4-year-old son of My Golden Song closed for fourth in his last race at Fair Grounds, and got a positive pace set-up today under jockey Danny Sorenson. "If a horse improves off its recent activity, it can work to your benefit and it did in his case," said Pish. Sorenson made a late move and powered past his nine rivals in 1:46.31 over a firm turf course, finishing 2 ¾ lengths ahead of Sunlit Song. Sunlit Song, owned by Carolyn Barnett and Becky Harding, led most of the way under jockey Lindey Wade aboard, and held for second. Defending champion Bonjour Baby was third and post-time favorite Picknngrinn completed the superfecta. Sent off at odds of 5-1, Highway Song returned $12.40 for the win, his third from 12 lifetime starts. The next stakes of the afternoon was the $50,000 Stonerside Sprint with a field of six going six furlongs. The high earner in the field, Leadem In Ken, showed his class as he picked up the 15th win of his career in his 40th start. Bred in Kentucky, the 9-year-old gelding is owned by Tyree Jacqueline Wolesensky and trained by Joseph Smith. With Danny Sorenson in the irons, the son of Sky Mesa sat off the pace, rallying on the far outside, crossing the wire in 1:11.45. Sightforsoreeyes owned by Looch Racing Stables LLC was also closing in the final furlong under Jose Ortiz, finishing second by one length. Direct Dial with Mike Smith in the saddle ran third, followed by Hold Me Black, Driven By History and Mischievous Bull. The race, formerly named the Sam Houston Sprint Cup, was renamed this year to honor the late Robert C. McNair and his Stonerside Stable. The well-respected Thoroughbred operation, in central Kentucky, produced national and international racing stars, including Congaree, Bob and John, Tout Charmont and Chilukki. McNair sold Stonerside Stable to Darley in 2008 to devote his full attention to his Houston Texans NFL team and numerous philanthropic causes. Stonerside Stable racing manager, John Adger, who serves as a Texas Thoroughbred Association Board of Director, was on hand for the trophy presentation. Trainer Mike Maker sent in two accomplished turf mares for the $50,000 Jersey Lilly Stakes, a mile and-one-sixteenth feature that ran as the finale on the Houston Racing Festival Card. Calumet Farm’s Susie Bee, made the most of her fourth start at Sam Houston Race Park, as she rallied from off the pace for the win. The regally bred daughter of English Channel reunited with rider Jose Ortiz and withstood a challenge from Terra’s Angel in the final strides, winning by a neck in 1:46.82. “She had a great trip and Jose gave her a good ride,” said Maker, who also won the Grade 3, $200,000 Connally Turf Cup with Bigger Picture. The striking gray 7-year-old mare won her eighth race from 35 starts and topped the $400,000 earnings with Sunday’s victory.